First a word of caution: these instructions LOOK massively long. They’re not that complicated! If I were to show you in person it’d take about 5 minutes. It’s just long because I’m going to do it slowly, step-by-step. So hang in there. First things first: you’ll need some pumpkins, and life will be a lot easier if you can get hold of some that are sold specifically for Halloween carving – these are more spherical and hollow, and are easier to cut. Even in Australia you can often find these in supermarkets. Here’s a photo from last year of some I found in Coles. You’ll also need a whiteboard marker so you can draw cutting lines on your pumpkin which wash off afterwards, and a small sharp knife for cutting. The cube is up first, and it’s going to be a fair bit longer than the others because I’ll hold your hand through the process. You can probably do a cube without any instruction, but it’s worth following along because it’ll help you get familiar with the system I’m using. Then, by the time you get to the more complicated shapes, it’ll be easy. 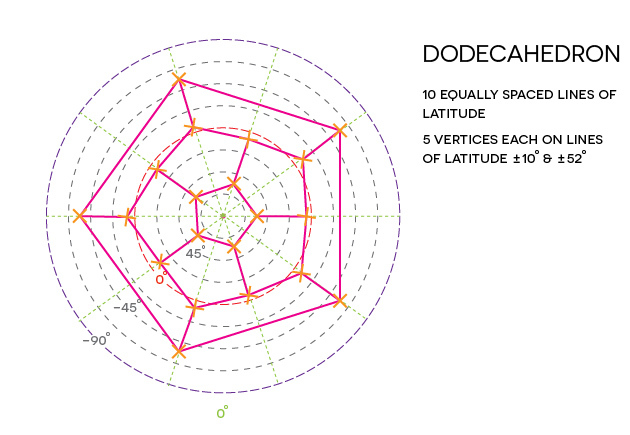 I’m going to describe how to mark out each polyhedron by using a latitude/longitude system. Think of each pumpkin as the earth, with the stalk at the north pole and the base at the south pole. The first step is to draw the equator with your whiteboard marker. It’s the belt line that runs horizontally around the widest part of the pumpkin. Now we have to draw some lines of longitude. These are lines that run from the north to the south pole. They follow the ridges or ‘seams’ in the pumpkin, which makes them easy to draw. For the cube we need to draw four equally-spaced lines of longitude, i.e. at 0° (think of this as a pumpkiny Greenwich Mean Time), 90°E, 180° and 90°W. Drawing a first line of longitude: this will be a kind of Greenwich Mean Time line defining 0 degrees longitude. All four equally-spaced lines of longitude. Now to draw the top four corners, or vertices, of our cube. 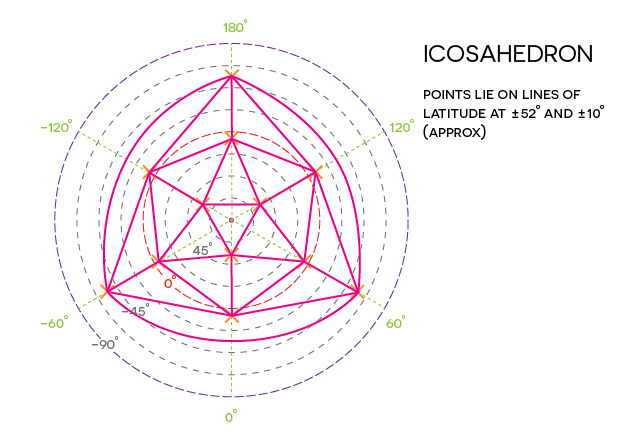 Each point will be on one of our four lines of longitude, at a latitude of 45°. This diagram will remind you that this is half-way between the equator (0° latitude) and the north pole (90°). 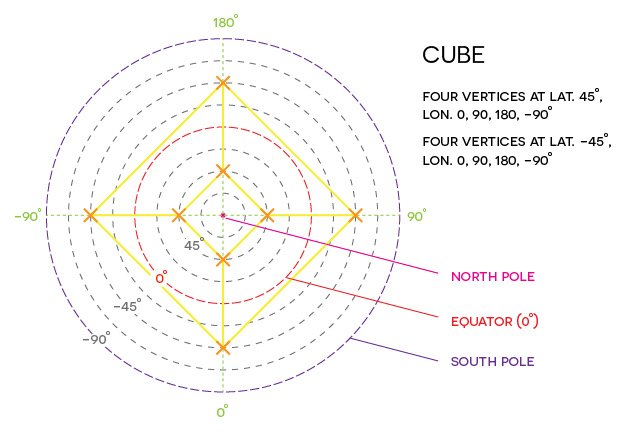 Finding the first vertex of our cube: longitude 0°, latitude 45° (or half way between equator and north pole). … and repeat in the southern hemisphere at -45° latitude too. Now use your whiteboard marker to join up the four bottom vertices into a square. Next, join the top four vertices into a square. Then join each southern hemisphere vertex with its northern hemisphere neighbour along its line of longitude. Top, bottom and side views of how the points get connected up to make edges. If the lines you make are a bit wonky (like mine), re-draw til they are better. Now that we have the position of the cube edges marked out, we need to know where to cut. Because the edges need some thickness, draw the new sets of lines so they run about a centimeter to each side of the existing lines. The red lines mark where to cut. Now the fun bit! Start a-cutting. Don’t forget: we need a flat base for the candle to sit on, so leave the bottom square intact. It’s going to look really gnarly at first so scoop out the innards, tidy up the edges and insides as best you can, and wash off the whiteboard marker too. Stick a candle inside and show it off once it gets dark! This chart summarises where we drew the vertices for the cube, and how we joined them all up to form edges. Since it’s hard to draw a sphere with all points visible at once, I’ll use a flattened version of the sphere called an azimuthal equidistant projection. 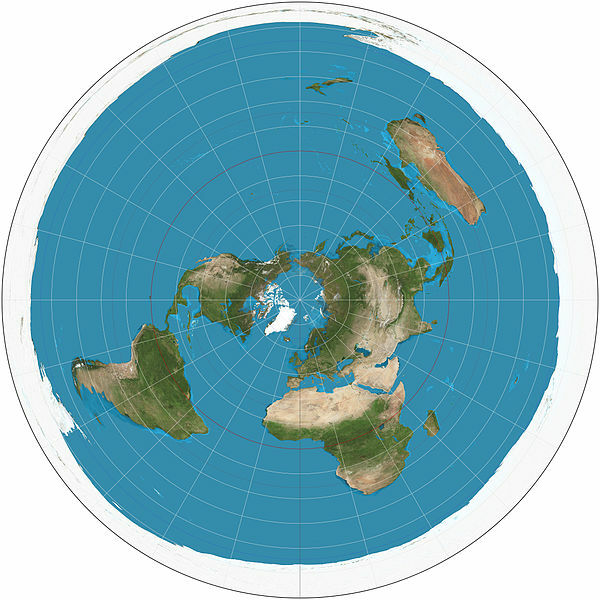 In this type of diagram, the north pole is at the centre, the south pole is stretched out to form a big circular outside edge, and the lines of latitude (including the equator) are concentric circles in between. The north pole is at the centre of the circle, the equator is the circle at middle distance from the centre, and the entire outside edge is the south pole. Source: Wikipedia | Azimuthal equidistant projection. If you can get the hang of this type of chart it’ll help, because I’ll be relying on them more heavily in the next sections. The tetrahedron is pretty simple – it’s a pyramid with a triangular base – so we’ll do it next. It’s also a lousy Halloween pumpkin because there’s a ‘bridge’ over where the candle flame goes, so unless you keep it under close supervision it’ll go up in smoke. Is it worth it for such a simple shape? Dunno. But if you really want to complete your Platonic Solids set (like me), here it is. Start by marking out your equator, then add your three equally-spaced lines of longitude. 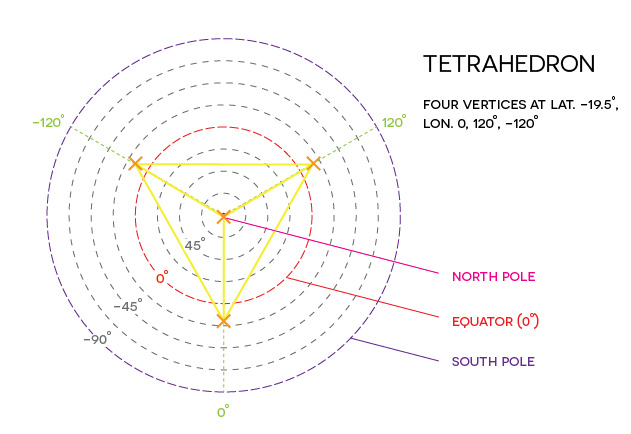 The top vertex is right at the stalk / north pole, and the bottom three vertices all lie at latitude -19.5°. To find this, start by taking one of the lines of longitude you’ve drawn and find the half-way point on it between the equator and the south pole (this is -45°). Then halve the remaining interval between this point and the equator to get -22.5°. Our -19.5° line of latitude will be just north of this point, so now you can draw it in. The three bottom vertices are the points where this new black dashed line crosses each of our three lines of longitude. Join them all up, remembering that the shortest lines between the two points won’t necessarily be parallel to the equator. Then add new cutting lines to the inside and outside to give our edges some thickness. This one has big wide faces, so it’ll be easiest to cut and clean up. Just be careful of scorching! 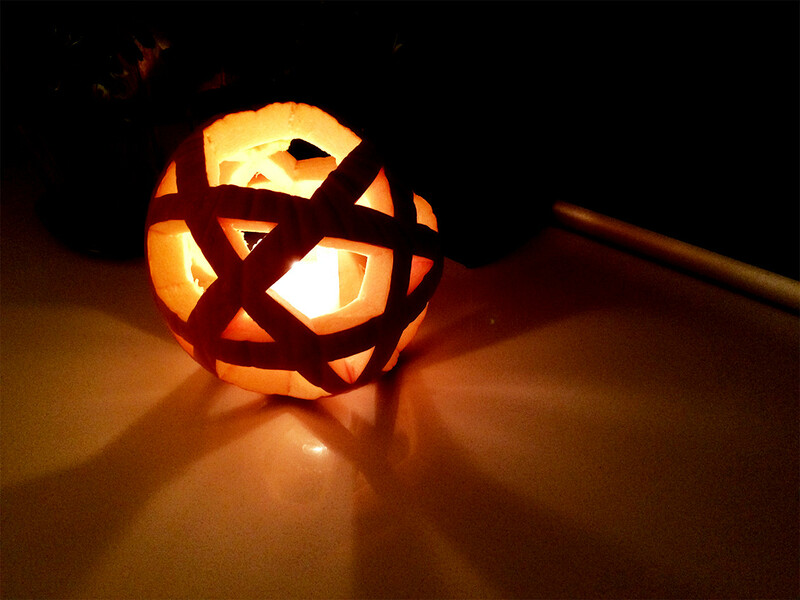 The octahedron would be super easy to plot out if its points could be on the top and bottom of the pumpkin. Unfortunately we need the bottom to be a flat surface, so we need to rotate the polyhedron around a bit. Luckily it’s still not too complicated: think of a triangle on top and a triangle on the bottom, and the two are rotated so the corners of one lie over the edges of the other. 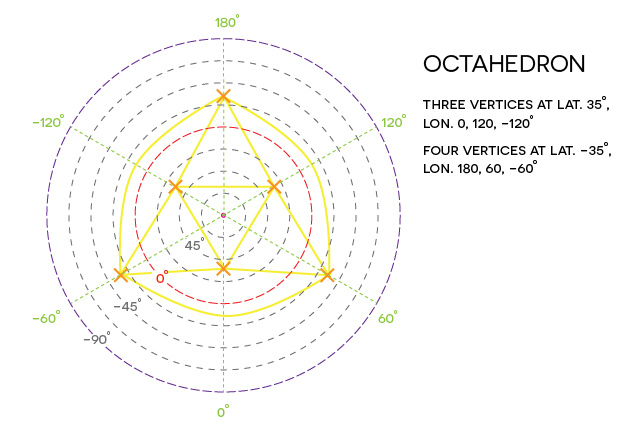 I’ve drawn the base edges of the octahedron in curved lines just so they are easier to see on this diagram. First draw in three equidistant lines of longitude. The top three vertices lie at latitude 35° up from the equator; roughly half way between the 1/2 and 3/4 points as shown. Repeat in the southern hemisphere, but the three lines of longitude will be at 60, 180 and -60° i.e. half-way between the northern hemisphere lines. Now join the top and bottom triangles with straight lines to create edges. The top and bottom triangles join up an a criss-cross pattern as shown in red. Now you can draw your cutting lines and get cutting, remembering to leave the base intact. This is one of the most beautiful shapes – it’s really satisfying to make. No progress pictures this time – see how you go with just the diagram! Start by drawing ten equally-spaced lines of longitude. It might help to start with five equally-spaced lines, and then when you’ve got those right, draw the next five half-way between. Now we need to draw four lines of latitude: two in the northern hemisphere at about 10° and 52° up from the equator, and the same in the southern hemisphere at -10° and -52°. Mark with Xs where the 10 and 52° line in the northern hemisphere cross the EVEN-numbered lines of longitude. Do the same in the southern hemisphere for the ODD-numbered lines. Then join them all up as shown in the diagram. The finished product. I accidentally sliced through one of my edges while cutting – oops. This is probably the most complex one – and the most fiddly, too, because the faces are smallest. But stick with it, it’s worthwhile. If you’ve made it this far, you should be able to work this one out just with a diagram and two progress photos. Once you’ve mastered the basic shapes it’s easy to move on to more complex ones, as they are all based on these five Platonic Solids. For example, it’s easy to make an icosidodecahedron once you mark out a dodecahedron, take the centre points of each edge, and join them to make extra triangles.